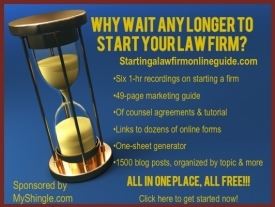 If 2019 is the year you decided to start or plan your law firm, MyShingle has some additional resources to support you. We’ve updated our Facebook page here where you’ll find daily articles and videos on starting a practice. and persisting in the face of rejected networking efforts. To view all videos, you can visit our YouTube Page here.